I gravitate towards desserts that have fruit on it and blueberries are an absolute favorite. On my recent trip to Sagada, they were in season and I got around 4 cups worth of blueberries and wished I got more. These wild berries lack sweetness and the skin is on the tart side when eaten fresh. 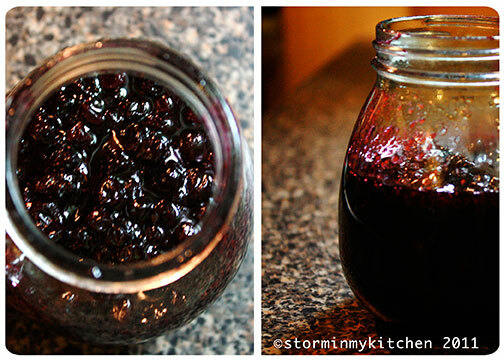 Make them into a jam or in my case, compote and they are to die for. Lovely on yogurt or pancakes. With the remaining compote, I made trifle. I initially used store-bought rum cake in lieu of sponge cake. It was either the cake was too dense and didn’t soak up the blueberry sauce or pound cakes are just too heavy for a trifle. It was dry and heavy. I also omitted the Grand Marnier because I didn’t have any. So on my 2nd attempt, I used broas, our local ladyfingers, which is airy and light. I liked this version better. Lighter and fruitier. I remembered that I had a 2 cl bottle of Kirsch, it was fabulous. It added a dimension to the trifle and actually brought out the flavor of the berries. What came out was a light enough fruity dessert to end a similarly light meal of fish or chicken. Place the heavy cream, mascarpone, sugar, and vanilla extract in a large bowl. Whip until soft peaks form. Arrange ladyfingers in the bottom of a clear glass bowl or trifle glass (if you have). Sprinkle ladyfingers with about 1 teaspoon of the spirit. Spoon about 1-2 tablespoons of the blueberry compote/sauce on top of the ladyfingers. Cover the sauce with a few of the fresh blueberries. Place a large dollop of the mascarpone cream mixture on top of the berries. Repeat the layers, starting with lady fingers. Cover and refrigerate for 4-24 hours to allow the flavors to mingle. Just before serving, sprinkle with some crushed Amaretti cookies. It will give it a good crunch. you just reminded me that it is blackberry season around here. and i don’t buy them at all. like everyone else around these parts, we picked them from all the wild blackberry bushes scattered all over the parks. You are currently reading Blueberry Trifle at Storm In My Kitchen.